Phillip Wesley VINEYARD was the eldest son, second child, of Thomas Milligan VINEYARD and Priscilla POOLE. Phillip is the great-grandfather of brothers Jack and Bill LEWIS (LEWIS-RICE lines). 2nd great-grandfather to the next generation (i.e., Jack & Bill's children). Phillip was born approximately 1834 and registered in Norris, the nearest town to his parents' Indian Creek land; birth year estimated from censuses. Thomas M. VINEYARD's father, John, purchased 160 acres in Section 28 of Indian Creek, White County, Illinois. The growth of Illinois was very rapid between the time it achieved statehood in 1818, when the population was under 55,000, to 1840 when it had swelled to 476,000 people. Where the red dot is on the green map, is Norris; Indian Creek region is just outside Norris on left side. 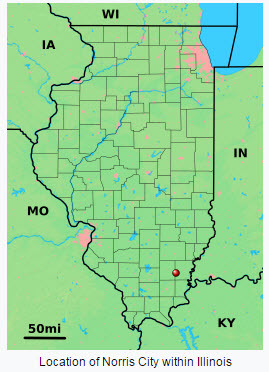 This southern region of Illinois had excellent land for farming. As mentioned, the VINEYARD family were farmers, and Phillip continued as a farmer, as shown on the 1850 Census, District 13 in White County, Illinois. Here I found 3 generations living together: Phillip's parents, his grandparents John and Leanah, and all Phillip's siblings but the eldest daughter Rebecca. She had married the previous fall to John F. Hill. Five years after the 1850 Census, on December 13, 1855, Phillip married Margaret C. WALTERS, daughter of Anderson WALTERS and Elizabeth JOYNER. Margaret's parents had come from Virginia and Tennessee to Illinois shortly before 1840. The two families farmed relatively near each other, in District 13, White County, Illinois. On the 1860 Census, Phillip married 5 years to Margaret, resided and farmed next to his father, Thomas. Thomas lived with his 2nd wife Samantha, and their family, plus Thomas' mother, Leannah [SNEED] Vineyard, aged 93. Phillip's mother Priscilla, had died in 1857, several months after her 10th child was born. Second wife, Samantha Garrett, had 4 children with Thomas; those would be Phillip's half-siblings, and he would have known them fairly well. After Samantha died in 1867, Thomas married the following year for a third time, aged 68 yrs, to Martha Thompson, aged 42. They had no children, but Martha would have been stepmother to Thomas' youngest children from his previous wife, plus Phillip's youngest full sibling, Jesse, 11 years old. Phillip died February 6, 1874 in White County, likely in Norris, aged only 40 years. Possibly there might be information in the local newspapers of the times, in 1874, with a notice of his death, or of an epidemic in the region, or an accident. I'm curious because 40 is very young to die. At his death, he left 8 children, the youngest only 1 year old, Rebecca. This name, Rebecca, is one of many repetitions of names in the Vineyard families. His widow, Margaret, married for a second time in 1878 to Francis Marion Berry, and they subsequently had two boys: Louis and Garfield Berry. Margaret died in 1918 in Mcleansboro, Hamilton County, Illinois, where she is buried with her second husband, Francis Berry, and their second son, Garfield. If you know anything more about any of the above VINEYARD individuals or other surnames mentioned, I would be so pleased for more details. And if you wish more information on them, I'm also happy to share. Contact me at my address at the bottom of the page calewis at telus dot net or, in the Comments section. My Blogger account seems not to allow me to "reply" to your comments. Do know that I value your comments immensely. You make my day! Thanks for stopping by to read my personal genealogy posts.